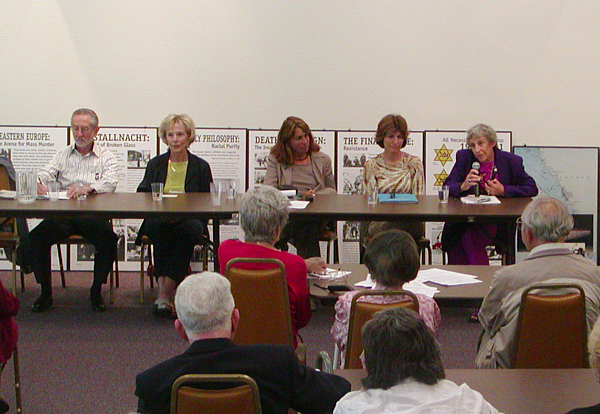 This weeklong workshop offered local and regional teachers an opportunity to learn about and develop teaching units using the "Portraits of Survival" exhibition about Holocaust survivors in the Santa Barbara community that opened at the SB Jewish Federation (524 Chapala St.) in November 2003 (pages by photographer Leib Kopman and curator Carla Shapiro; 11/7/03 UCSB Daily Nexus article). Students explore Jewish Federation Holocaust exhibit," Santa Barbara News-Press, Dec. 15, 2004. 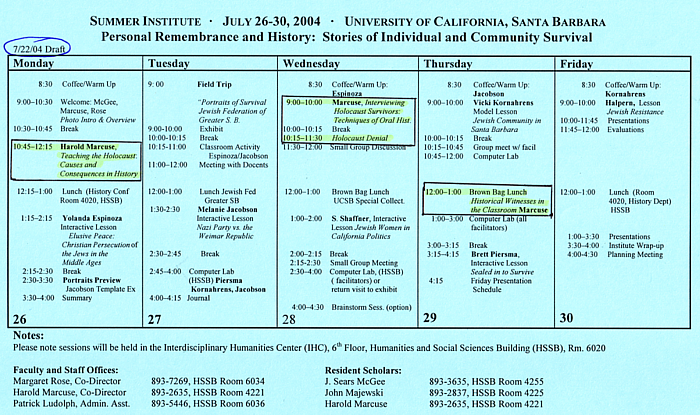 I (UCSB Professor Harold Marcuse) gave several presentations during the week, which I'm making available here. 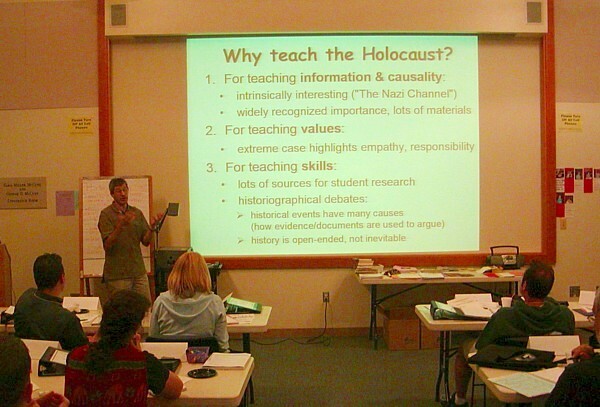 "Teaching the Holocaust: Causes and Consequences in History" (31 slide powerpoint). This presentation opened the week. 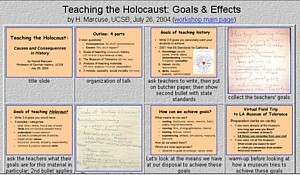 I wanted to focus on our goals as teachers of history when we teach about the Nazi Holocaust. 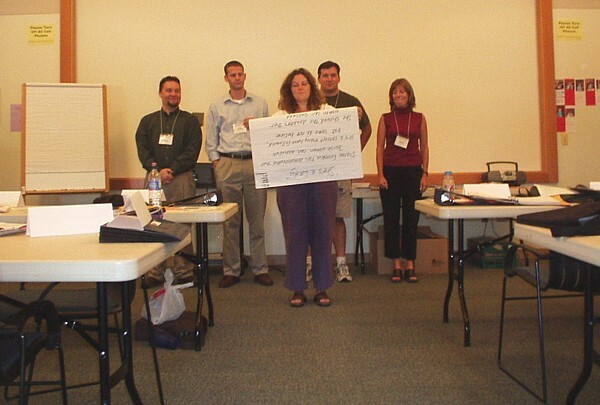 I examined the LA Museum of Tolerance and we examined several teachers guides, looking at how these materials teach the subject, and to what extent common goals of teaching about the Holocaust come across to students. My main argument was that it is extremely difficult to teach things like "tolerance" and "sensitivity" directly, and that we might do better to aim to make our students better critical historians. 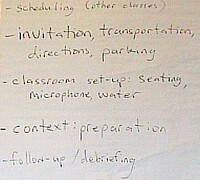 Brownbag: "Historical Witnesses in the Classroom: Practical Issues" (list of things to consider). 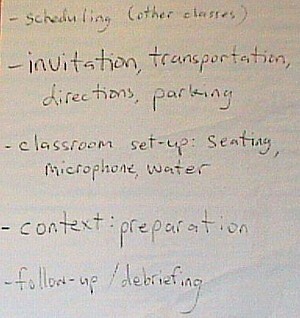 How does a teacher organize a classroom visit by a historical witness, and what increases the effectiveness of that visit in achieving our goals as teachers? Thus we should, I think, teach about causality, indeterminacy and human agency in history, but not try to dictate or derive certain moral lessons for our students. "Interviewing Holocaust Survivors: Techniques of Oral History" (11 slide powerpoint). After a short reflection on our teaching goals, I offered some general guidelines on how to conduct interviews, and we paired off to try them out. I tried to develop some general principles that could be used for any historical event, not just with Holocaust survivors. 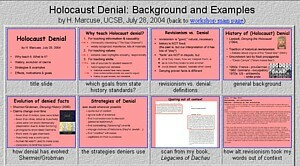 "Holocaust Denial" (19 slide powerpoint). This topic seems to generate a lot of interest. I started with some definitions and history of the "movement." My first point was that these arguments are basically pure bunk (except for a few chance cases when they caught understandable errors), and that the deniers know very well that what they are claiming is not true. I argued that their underlying motivation is probably an inferiority complex that manifests itself as "white pride" (racial supremacy) and antisemitism. Some deniers probably do it for the publicity and attention they can get from it. 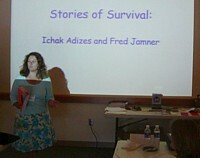 Mara Vishniac Kohn, the key initiator of the "Portraits of Survival" exhibition, attended many of the sessions during the week. She shared with us an antisemitic German children's book, published in 1936, that her father had bought at a used bookshop during a 1947 visit to Berlin. (Mara's father, Roman Vishniac, was a famous photographer. He was in postwar Germany to take pictures of Jews in refugee camps. In 1999 Mara published some of his photos of family life in 1930s eastern Europe as Children of a Vanished World; amazon link.) We scanned the pages of this powerfully insidious work "Don't trust a fox in the field or a Jew's promise." Mara is preparing a transliteration and someday we may have time to translate it (images of childrens book). I passed out a list of references that I mentioned in my presentations.